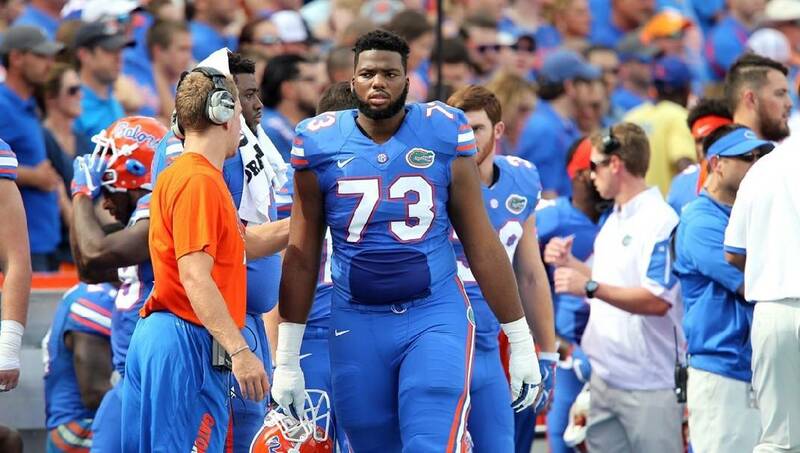 Florida junior left tackle Martez Ivey, the top offensive lineman nationally in the 2015 signing class, has played mostly left guard since arriving in Gainesville. Florida has not been picked to win the Southeastern Conference football championship since 2009 and hasn't been selected to win the league's Eastern Division since 2010. The Gators have played in the past two SEC title games, losing both decisively to Alabama, and being tabbed second last week to Georgia in the East voting did not surprise Florida 6-foot-5, 302-pound junior left tackle Martez Ivey. "Personally, I don't really pay attention to it, but as a team we take it as motivation," Ivey said at SEC media days. "I mean, we have been the underdog for the last two years that I have been at Florida. I really don't expect anything less from the people putting us under and saying we can't do this or that. "We set our own limits for ourselves, and we don't let anyone else set them for us." Fun fact: The coaches in SEC history with the most league wins in their first two seasons are Auburn’s Terry Bowden (14), LSU’s Les Miles (13) and Florida’s Jim McElwain (13). The way Ivey sees it, the Gators are the two-time division champions and have a better team this year. Of course, who winds up as their quarterback this season will be one of the hottest topics throughout the league in August camp. Redshirt freshman Feleipe Franks won the job coming out of spring practice, but the program added Notre Dame graduate transfer Malik Zaire in early June. Whether it's Franks or Zaire who ultimately prevails, Ivey knows he has a job to do. "We have to have great offensive line play," Ivey said. "It starts with us, and they go as we go. If our quarterback is on as well, I can't name any teams that can stop us. We're loaded this season at wide receiver and running back and on the O-line. We've got competition at quarterback. The sky was thought to be the limit for Ivey when he came out of Apopka (Fla.) High as the nation's top-rated tackle prospect in the 2015 signing class, but not everything has gone as hoped. Just before the start of his freshman season, Ivey had to undergo surgery for a slightly torn meniscus. He missed Florida's first two games in 2015, and when he returned he was needed more at left guard due to a lack of bodies. "I told them I would do whatever they wanted, because I was hungry," Ivey said. "It was a humbling experience, but I got to learn the game and learn defenses. Playing guard can be reassuring, because you have help most of the time. "I feel like I've got this experience now and have become a better pass-blocker, and now I know I can go out there and hold my own. It's all about being patient and working on my feet." Ivey wound up making 19 straight starts at left guard during the past two seasons, but he was moved earlier this year back out to tackle, which third-year head coach Jim McElwain considers his natural position. "It speaks volumes to his unselfishness that he went in there and played at guard knowing that we needed that to happen," McElwain said. "That first year we were here, just through some bum luck and some things that had happened, we only had four scholarship offensive linemen. We had to piece a group together, which we were able to do. "In Tez's case, I think he'll really flourish now." The Gators return four starters on the offensive line and also bring back junior running back Jordan Scarlett, who rushed for 889 yards and averaged 5.0 yards per carry a year ago, and junior receiver Antonio Callaway, a proven big-play threat who amassed 721 yards last season. Florida has experience returning defensively up front and in the secondary, leaving linebacker as the biggest concern following the departures of NFL picks Jarrad Davis and Alex Anzalone. Florida returns both specialists and a coach who has made the most of what he's been dealt to this point, and there is also a schedule that can be viewed two different ways. The Gators arguably have the nation's most challenging nonconference duo, considering they open against Michigan in Arlington, Texas, and close against Florida State. Yet due to the neutral-site matchups against Michigan and the annual clash with Georgia in Jacksonville, the only opposing stadiums Florida will visit this season are those of Kentucky, Missouri and South Carolina. "I'm excited about this year because we've got a lot of home games," Ivey said. "We've got a lot of big home games, and our fans are going to help us out. Nothing gets as loud as the Swamp."